Durvesh lives in a village close to Alibaug, Maharashtra. He studies in Saaral Madhyamik School in his village. He suffers from a rare form of cancer called Hodgkin’s Lymphoma. Durvesh was first diagnosed with Hodgkin’s Lymphoma in 2014 and he underwent chemotherapy to treat the same. With 6 sessions of chemotherapy, his lymphoma cleared. However, within 2 years, his lymphoma relapsed. He has been undergoing chemotherapy once more and is scheduled for a BMT on November 16, 2016 at the Kharghar branch of TMH. 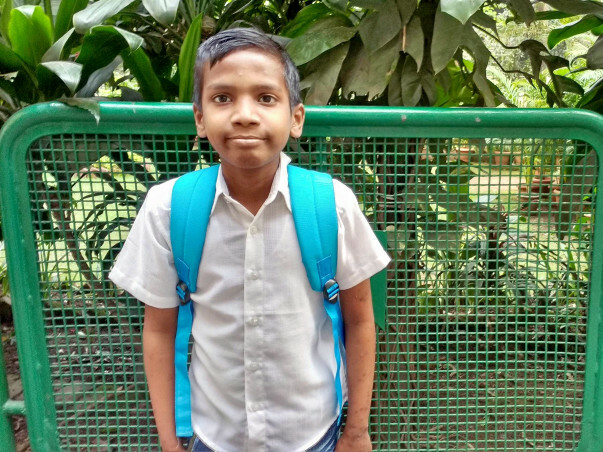 His mother, Shubhangi, suspected a relapse in February this year when Durvesh started coming home more tired than usual, complaining of pain in his arm. He would not play with his friends and would stay at home, often due to fever. On examination, his relapse was detected. Durvesh’s father, Sharad Shankar Mhatre, drives an auto rickshaw in Alibaug. His mother is a housewife. Durvesh has an elder brother, Viraaj, who is studying in 11th standard. Durvesh and Viraaj share a very close relationship and often play and study together. Durvesh is an energetic child with a positive approach to life. He makes friends easily and makes a lot of jokes. He enjoys watching Doremon. He is very good at his favourite subject, Mathematics. 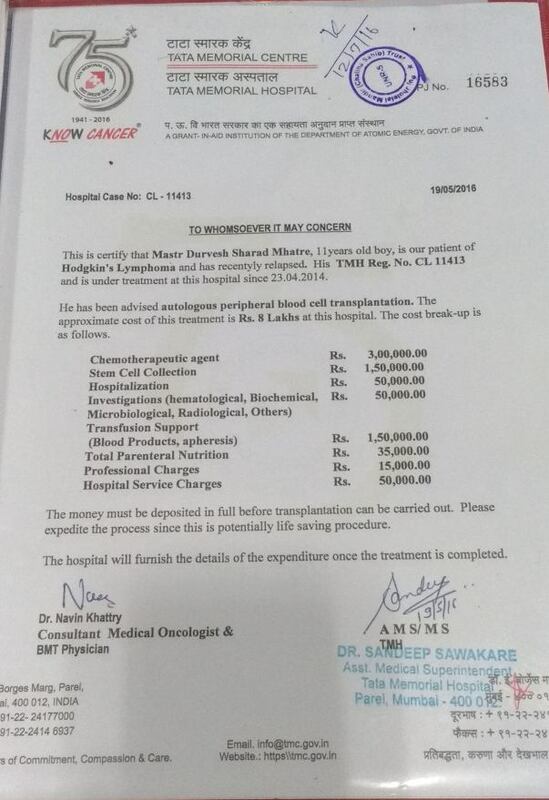 Durvesh was scheduled for a transplant on December 24. Unfortunately, he developed an infection due to which his transplant has been postponed. He has been called in for a check-up on January 5. Durvesh’s father, Shankar, has promised to keep you informed about his progress. Doctors are hoping to conduct the transplant by the end of January if Durvesh’s infection subsides. We will keep you updated on his progress. Thank you for your support. Dear Durvesh , Wish a very fast recovery for you.